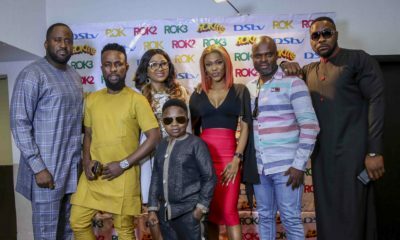 Nollywood actor and member of the Lagos State House of Assembly, Desmond Elliot has teamed up with another actress, Mercy Aigbe to headline a national campaign initiated to draw attention to the plight of widows in Nigeria with a view to ameliorating their suffering. At a press unveiling organized in Lagos, Friday by the Felix King Foundation, Elliot and Aigbe spoke strongly against many cultural and behavioural practices in many communities in Nigeria that tend to limit the rights of widows, disinherit them and treat them following the demise of their husbands and vowed to continue speaking out until there is a social movement towards the direction of not just protecting widows but creating an environment of economic and social inclusion that would enable them deal with the pains of their losses much more easily. Speaking on the plight of widows in many communities in Nigeria, Elliot wondered why it is usually convenient for men to blame women for the deaths of their husbands and spoke of the need for government and all layers of society to work towards a total change of attitude towards these vulnerable members of the society. “We live in a society where women are blamed each time a man dies. 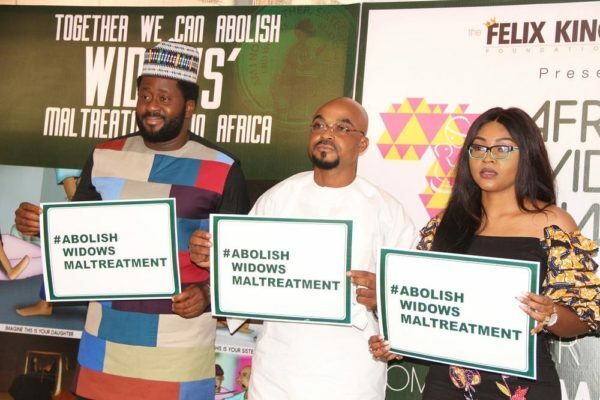 But no one ever thinks of the pains they have to bear in bringing up the children left behind,” Desmond said and called for legislations across the states of the federation that will criminalise maltreatment and disinheritance of widows. He also called on men to prepare for the eventualities of their death by writing their wills as a means of protecting the future of their children and the comfort of the women they very likely will leave behind. 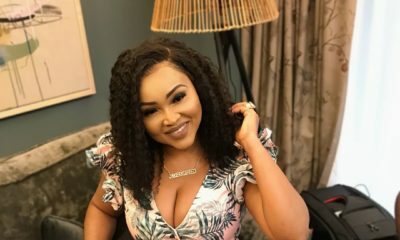 Adding her voice to the challenge, Mercy Aigbe also called for a general change in attitude by society towards widows while also not leaving out the cultural practices that form the foundations of the dehumanization of widows in Nigeria. “We need to deal with some of these cultural issues that are generally skewed against women. We need to abrogate them and ensure that the rights of these widows are protected. We live in a society where economic power still rests with the men. This is why we need to talk to community leaders, especially in the rural communities where these victims, most of whom are poor and uneducated, are found so that the change can be effective, starting from the grassroots upwards,” Aigbe said. Earlier in his address, Founder of Felix King Charity Foundation, Felix King, expressed sadness over the continued maltreatment of widows in many societies in Nigeria and spoke of the commitment of his foundation to end it in all its forms and manifestations in all parts of Africa. He said the foundation, founded in 2016, organized the first ever International Summit for Widows in Nigeria and has since then, made several interventions in the quest to ease the suffering of widows. “Our interventions to make life easier for widows have been designed to create an environment of inclusion for these suffering women, empower them to be financially independent, enable them feel and experience the love of society one more time and create a healthy environment for their equally deprived children to be integrated into society through education and other enabling welfare interventions,” he stated. 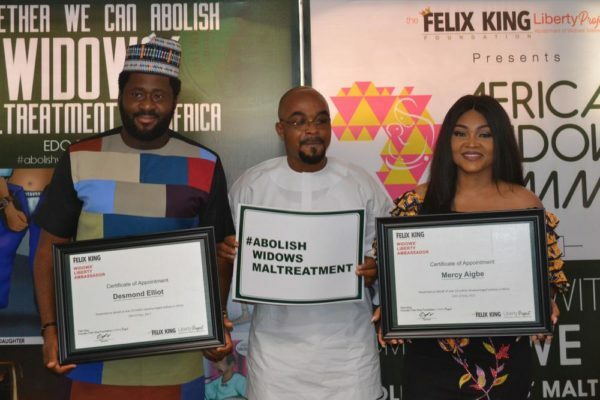 While appreciating the support being provided by Desmond Elliot and Mercy AIgbe on the projects, Felix King revealed that his Foundation will host an International Widows Summit in Benin, the capital of Edo State, during the International Widows Day of June 23, 2017 to further highlight the need to protect the rights of widows in Nigeria. He said the Foundation is already on the quest to raise one million signatures across Nigeria in support of the need to abolish all negative widowhood practices in Nigeria and Africa. “We intend to collect at least one million signatures of Nigerians and Africans in support of the abolition of these negative practices. We are also hoping to forward these signatures and a Bill to the Edo State House of Assembly for a law that will criminalise the maltreatment of widows in the State. We are hoping that after this first step, same effort will be replicated across the other 35 states of the Federation and Abuja and by so doing, make this needed change happen. 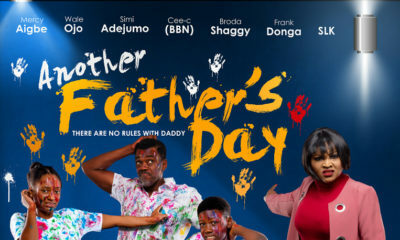 Admitting the task is onerous and cannot be successfully undertaken by one person, he expressed the belief that with the two popular Nollywood actors joining voices with one million signatories to the petition, Nigeria will be rid of prejudices and other negative practices against widows in a very short time.